Nearly twenty years on from his infamous (for all the wrong reasons) film debut in The Mummy Returns, Dwayne Johnson has become one of Hollywood’s most reliable movie stars, with oodles of screen presence and charisma to carry him through even the weakest material, and it’s even gotten to a point where his name alone can open a movie in the same way that Stallone, Schwarzenegger and Willis did back in the day. Speaking of Bruce Willis, it is that actor’s most famous movie that Johnson is now trying to make his own, but although Skyscraper isn’t officially a Die Hard remake, it might as well be one; this movie is basically Die Hard on steroids, and is as over-the-top and ridiculous an action movie as anything that Johnson himself has been attached to in the past. It is also, however, a perfectly harmless escapist movie that the man himself just about keeps afloat. Johnson is Will Sawyer, a former FBI agent who, after a failed hostage rescue mission which results in him losing his left leg, now works as a security assessor at The Pearl, a hi-tech skyscraper in Hong Kong that ranks as the tallest building in the world. The Die Hard element kicks in when – of course – European terrorists hijack the building and set it alight, with Sawyer left to find a way back in to save his family, who – again, of course – are trapped within the blaze that is very quickly making its way up floor by floor. So far this year, there have been two movies where Johnson has taken on something that dwarfs even him in size, first with Rampage and now this, and funnily enough both of them would feel right at home back in the day when those past action heroes could still draw a crowd. Skyscraper is more of a straightforward action movie than Rampage, which was largely just a B-movie monster flick, which is probably why it mirrors an action classic like Die Hard pretty closely, down to using almost some of the same shots but with extra firepower added in there. It fits neatly within a lot of movies that came out back then that were trying to cash in on the success of Die Hard, right down to having a similar premise and a set of characters that are pretty indistinguishable from the likes of John McClane, Hans Gruber and even that classic sleaze-ball Ellis (“Hans, bubby, I’m your white knight!”). The similarities are blatant, and they do hinder the film because you’re constantly reminded of another movie that did this whole plot way better, and in a much less cheesy manner than this movie is doing it in. On its own, though, the movie is serviceable enough; it knows its audience just wants to see a big, ridiculous action flick with a certified movie star, and that’s exactly what it delivers. You get the big action set-pieces, the over-the-top villains, the big moment where the hero overcomes a great obstacle to remain in the game; you name it, it’s all here for you to digest. You certainly know all the beats it’s going to hit, such as certain character introductions that just scream “surprise bad guy”, but writer-director Rawson Marshall Thurber – Johnson’s director on his 2016 vehicle Central Intelligence – is nice enough to get some of the more obvious ones out of the way for us fairly early on, leaving the majority of the film to just be largely an action movie showcase for its lead. It was also nice of him to write Johnson’s family, who in any other movie would just be the stock one-dimensional damsels in distress for our hero to save, as relatively competent characters who all help each other get out of this bad situation, with Neve Campbell as Johnson’s wife getting a little more to do than just worry about the safety of her husband and children. Even so, nothing about the characters or the story sets itself apart from most other high-concept action movies like this, but it was kind of Thurber to at least inject some kind of humanity into these people. As for Johnson himself, he’s still as charismatic and likeable as ever, and he really does sell a lot of these action scenes which see him do the most logic-defying stunts that you’ve come to expect in this kind of movie (that famously mocked teaser poster where Johnson is leaping off a crane towards the building that’s way out of reach – a mistake that’s rectified in the final cut – is a prime example of that). The fact that his character has a prosthetic leg really doesn’t play much into the overall story, other than the precious few times it comes in handy during an action scene, but it does symbolise how this is a guy who’s not as indestructible as the common action movie hero, which makes things a bit more tense when you’re not sure whether or not he’s going to make it out of this ordeal alive (even though in your head, you kind of already know the outcome). Johnson is what really holds this film together, as he usually tends to do in films like this one, and he makes the film a lot more entertaining than it probably is. It’s likely that this will be yet another big action flick that will come and go, destined for life as a solid rental to queue up on Netflix for a decent night in, or in this movie’s case side-lined in favour of Die Hard, but Skyscraper is decent escapism that will do its job and then leave you to go on about your day. It isn’t great, but it’ll do just fine. 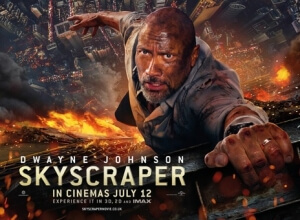 Skyscraper is a perfectly serviceable action vehicle for Dwayne Johnson, who’s reliable as ever and just about holds together a film that is essentially Die Hard on steroids, which makes it difficult to appreciate the film on its own, but there are decent things to it that make it just about worthwhile, even if not entirely memorable.